Community leaders in Melbourne have met to explore and debate the pressing social issues facing Victoria, ahead of the November state election. Community leaders have met at the VCOSS Framing the Future forum in Melbourne to explore and debate the pressing social issues facing Victoria, ahead of the November state election. Cath Smith, VCOSS CEO hopes the event will kick start the public debate period for the Victorian State election resulting in meaningful discussion about critical issues. Smith says Victorians want to see solutions to the big problems like housing affordability, climate change, social justice, sustainability, urban sprawl and lack of services in rural communities. The Framing the Future forum was divided into two parts: the challenges faced by community organisations across Victoria, and the a panel discussion on big ideas and the way forward for the community sector. Challenges facing the community sector were highlighted by speakers showing the challenges facing 5 very different community organisations. Alexandra Gartmann, CEO Birchip Cropping Group, described the flow-on effect that drought and changing climate conditions have for rural communities and communities organisations. Gartman says that community organisations suffer when farmers are doing it tough, as people are less likely to volunteer time or donate money when they are financially stressed. 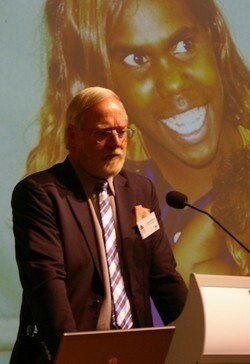 Gartman highlighted the important role rural community organisations have in building community ties and developing social connectedness, especially in times of hardship. Michael Perusco, CEO of Sacred Heart Mission, challenged the Federal Government over their approach to negative gearing and social housing, saying that a system which encourages investment in social housing could be established with the necessary political will. 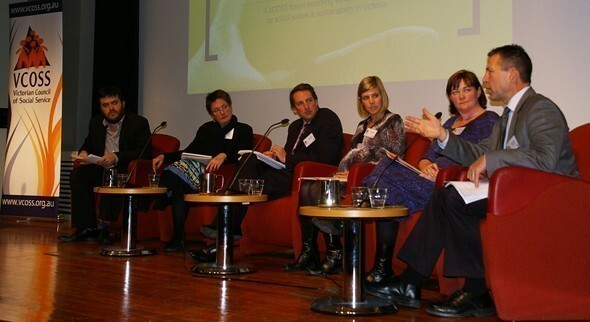 The afternoon session featured a panel discussion on future challenges and the way ahead for community organisations. Discussion ranged from the need for the sector to prioritise a small number of issues ahead of an election, the problematic nature of measuring social connectedness and the need to introduce a carbon price in a way that doesn’t unduly affect disadvantaged people. In wrapping up the Forum, panel members were asked what they would want to see from both parties ahead of the Victorian state election. Peter Ruzyla CEO, Eastern Access Community Health, says governments should give high priority to the issue of mental wellbeing. He says an approach that tackles this issue seriously will address a lot of other things along the way, such as domestic violence, education, homelessness. Jodie Willmer, CEO, Travellers Aid, says all political parties need to have a future focus, looking 20 years forward when thinking about policy. Kristen Hilton, Director Civil Justice, Access and Equity, Victoria Legal Aid would like to see free public transport, at least for concession card holders. Hilton says both parties need to bring out strong policies around disability issues, including the National Disability Insurance Scheme (NDIS), and proper funding of the community sector is needed, so that organisations are able to attract and retain quality staff. John Daley, CEO, The Grattan Institute says he would like to see politicians explicitly articulate a commitment to increasing social connectedness and a commitment to measure it. Dr Kate Auty, Victorian Commissioner for Environmental Sustainability wants to see a price on carbon. Auty says this is the single most requested action from people that she speaks to. VCOSS have produced a 2010 State Election Platform, calling on parties to look at the ‘cause, not the consequence’ in developing their election policies. Fully f und the pay equity outcomes for all community services in Victoria to ensure high quality services for all Victorians.